Fastmarkets AMM provides monthly spot market price assessments for stainless primary and secondary materials in many of the most common alloys including 304 and 316. Stainless steel bar, cold-rolled sheet, and coiled plate prices are assessed on the first Thursday of every month. Our stainless steel prices are widely accepted as the benchmarks due to sound price assessment practices and our reputation as the most trusted brand in the metals industry. We have been pricing primary stainless materials for decades. 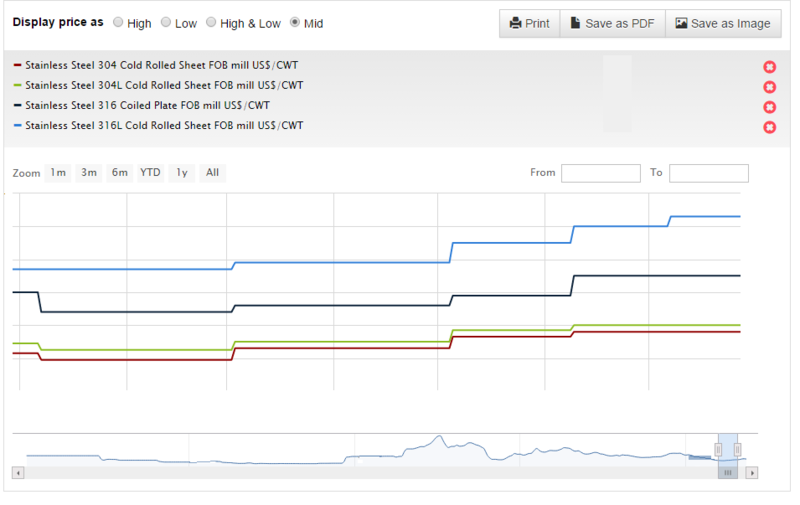 Each of the materials below will have over 20 years of pricing data available in Price Tracker available for charting and downloading (with the proper license in place). Visit the landing page for each of the grades listed to view the price specifications and terms. As always we invite feedback and participation from the market in the price assessment process. 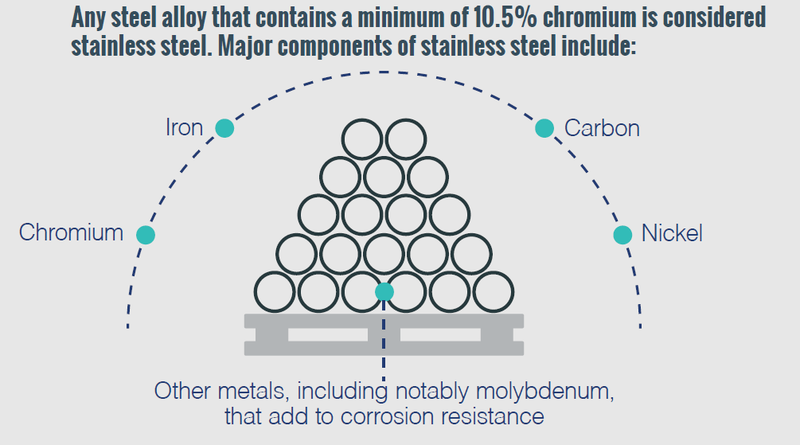 Because of the nature of Stainless steel, its costs are heavily impacted by the mix of alloys it contains. Many producers place surcharges on their stainless prices to manage risk in volatility of raw materials. Fastmarkets provides prices for many of the materials that are ingredients in various stainless alloys, some of which are considered benchmarks used by stainless producers to calculate their surcharges. 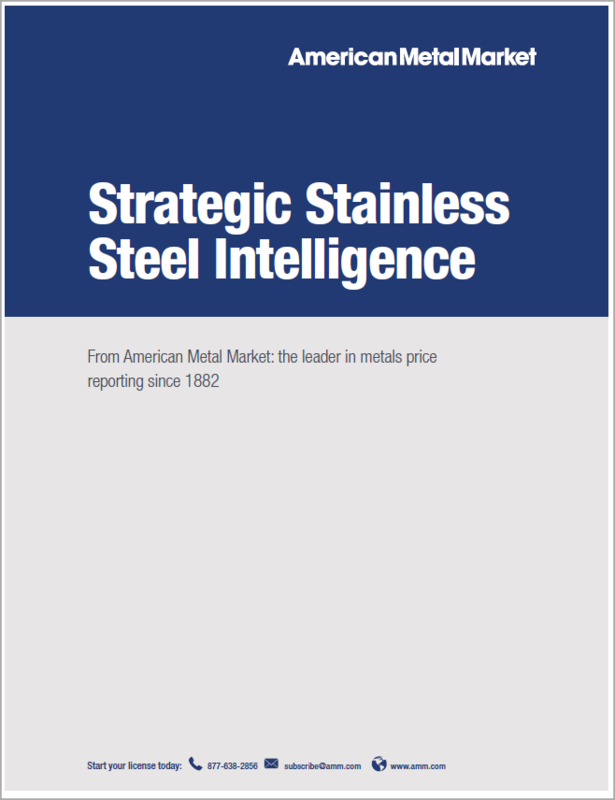 Get a sample of stainless steel pricing and market stories. industries since the material took it's place in the market. Our stainless steel scrap prices are widely accepted in the industry as the benchmark prices used in contracts. One of the things that really sets Fastmarkets AMM apart from other price reporting agencies is that we price scrap metal with the granular market detail necessary to help you get the full picture specifically for your region. Knowing what's going on in your region is so important because there are many factors that determine a price, many of which are related to location. Click the regions below to see what other scrap materials we price in each region. Stainless steel is used in a variety of applications with machinery and transport industries using the most stainless steel according to The International Stainless Steel Forum, ISSF. Stainless steel is 100% recyclable and is non-toxic. Nickel is an integral component of stainless steel. Stainless steel, when combined with nickel, chrome, and other alloying elements, improves corrosion resistance and fabrication properties like strength, high temperature performance and machinability. Stainless steel has been used in numerous iconic structures including the Chrysler building in New York City, The Cloud Gate sculpture (aka The Bean) in Chicago and the St. Louis Arch monument in Missouri. Stainless steel offers many advantages including corrosion resistance, fire and heat resistance, easy hygiene, ease of fabrication, aesthetic appearance, impact resistance and long-term value. Austenitic stainless steel grades contain major elements such as nickel, chromium and molybdenum either chromium and manganese or chromium and nickel. The most common austenitic grades are 304 and 316. Applications of austenitic stainless steel include: appliances, chemical processing equipment, and hardware. Martensitic stainless steels are a result of high levels of carbon and chromium that are added to iron. The most common martensitic grades are 410, 420 and 440. Applications of martensitic stainless steel include: surgical instruments and cutlery. Ferritic stainless steels are magnetic and contain chromium and iron with controlled amounts of carbon.. The most common ferritic grades are 409 and 430. Applications of ferritic stainless steel include: automotive exhaust systems, architectural interiors and food processing equipment. Duplex stainless steels are both austenitic and ferritic. Applications of duplex stainless steels include: offshore drilling rigs, pipelines and keel bolts. Precipitation hardened stainless steels have a low level of carbon and develop strength as a result of heat treatments. Applications of precipitation hardening stainless steels include: valves, gears and golf clubs. Stainless steel was first discovered at the beginning of the 20th century. Thanks to Harry Brearley, head researcher at Brown Firth Laboratories, stainless steel was first produced. An arms producer asked Brearley to develop a gun barrel that would be erosion resistant. While experimenting, Brearly alloyed 12.% Chromium with .24 Carbon and accidentally produced the first stainless steel. Soon after, 400 grade stainless steel table cutlery launched the industrial era of the new metal. 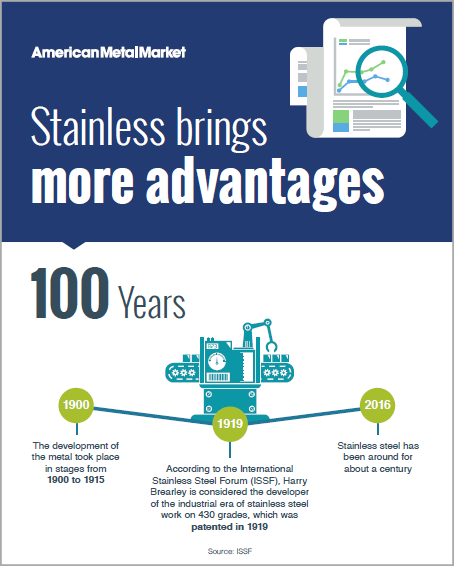 Today, the stainless steel market is vast and full of innovation. The material can be seen in everyday applications in the home, in industry, in hospitals, in food processing, in farming, in aerospace and in many other areas. Want more general information about Fastmarkets AMM prices? Check out the "About Our Prices" page to get an overview of our pricing. Everyday, our customers rely on us to provide the most reliable pricing of the industry. But how do we assure our customers that our data is trustworthy? Visit our Methodology page to learn more about our price assessment process, code of conduct and data submitter policy. Interested to know more about what is included with your purchase of a Fastmarkets AMM license? Visit our Product Page to see how our data license can transform your business. Ever wish metal prices would just automatically feed into your workflow? Fastmarkets AMM can create a custom data feed for you that can do just that. Visit the Data Feed page to learn more. Fastmarkets AMM is looking for credible metal market participants active in the buying and selling (on a spot basis) of certain materials. Read our Data Submitter document to learn how you can contribute.